Dr. C J Abrahams' ForceField™ UNIVERSAL PROTECTIVE HEADBAND Designed Specifically for SENIORS! Experienced manufacturer's representatives calling on nursing homes, assisted living facilities, Veteran's Hospitals for the traumatically brain injured patients, facilities for brain injured patients, and organizations they cater to the elderly. We are looking for manufacturer's reps who cover nursing homes, nursing facilities, assisted living facilities and Veteran's Hospitals. Our product is the #1 provider of protective headgear for all contact sports throughout the world. Please visit our website. The Universal Forcefield product line is recognized as the most universal protective headband ever invented with over 20 applications. We have a product line specifically made for Seniors which we have been successfully selling to a few nursing homes and Veteran's facilities in the past. Our product line is protected by US patents. The Universal Protective ForceField line looks just like an ordinary sweatband. 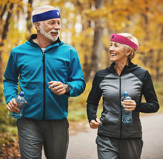 It is a combination sweatband, headband and headgear that is capable of absorbing and dissipating over 50% of the impact force to a Senior's brain and head. There is no competition for our senior product line unless the senior rather wear a full helmet. Our products sell for $15 plus shipping. Nursing homes can order anywhere from 30-300 at a clip. Once you receive orders, they continue annually or reorder several times a year. The commission rate is $5 (33.33%) for every one sold. The nursing home pays their bill and we pay you within 24 hours after their check is cleared. Your territory is protected. It is also important to note that if any entity attempts to bypass you in your territory, the account is still yours and you will receive the commission. If you have any questions or need additional information, please call Dr. Abraham or Rosi. We offer large commissions (33.33%) recognizing the hard work and time that the reps are involved in making a living and a commitment to the Forcefield product line.